Douglas Chien's Oak Park garden is attractive, colorful and full of life — and full of native plants. His garden was one of eleven featured on the September 7th, Birds, Bees & Butterflies native garden tour, which was co-sponsored by Green Community Connections and West Cook Wild Ones. In fact, many birds (including a female goldfinch), bees and quite a few species of butterflies appeared in his garden that day. 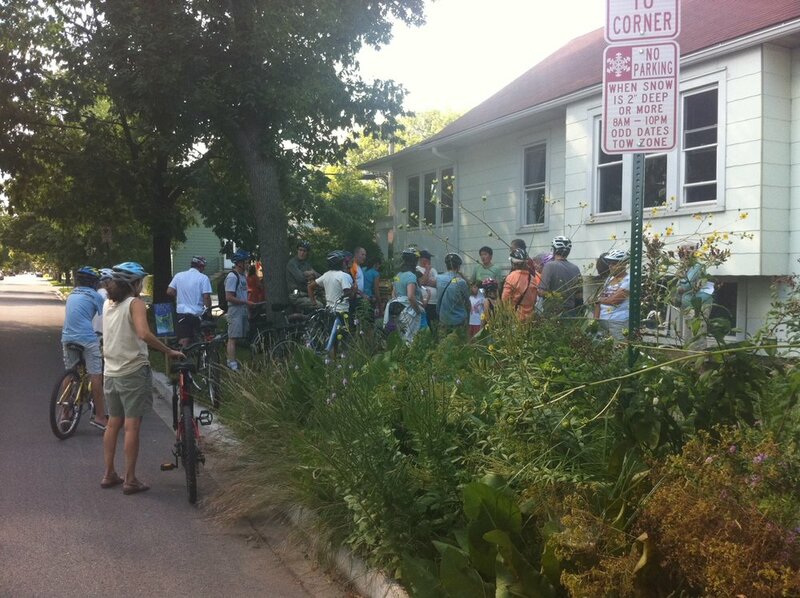 Plus, more than 70 people came through for a tour. Douglas, the Advocates' Network Manager with Friends of the Forest Preserves, explained to visitors how he created his native plant oasis in the heart of West Cook County. About 12 years ago, Douglas and his partner Michele Gurgas bought their Oak Park home on a corner lot, which had a traditional landscape highlighted by lawn and two large American elm trees gracing the parkways. But within the year, the trees succumbed to Dutch elm disease and were taken down. To take advantage of the new, plentiful sunshine, Douglas planted two young native trees in his front yard: an American plum and a pagoda dogwood. In addition, he asked the village to plant a bur oak in the parkway. "I requested that the village buy the tree from Possibility Place Nursery, which specializes in native plants that are local ecotypes," says Douglas. Local ecotypes are plants that were propagated from parent plants that have been growing in our specific area for hundreds or even thousands of years. Today, his well-adapted bur oak has a graceful structure and is healthy and vigorous. These three trees form the basis for a savannah ecosystem in his east-facing front yard. On the ground, a mix of sun- and shade-loving plants mingle, including wild ginger, five species of milkweed, pale purple coneflower, three goldenrod species, American beak grass, trout lily and Joe Pye weed. Along the sunny, south side of his home, Douglas has built a prairie in the parkway. Purple prairie clover, several aster species, prairie dock and a variety of grasses and sedges smile at the sun. "I recommend to people who want to plant a native garden that their plant mix include at least 50 percent grasses and sedges," Douglas says. "They provide support to the flowering plants. Grasses and sedges also compete for space and nutrients, so the flowering plants don't get too tall and leggy." He also adds: "Density and diversity are key to a successful native garden. You want as many different kinds of plants planted very close together. Planting on 12-inch centers, like typical ornamental gardening, leaves room for the weeds." Native habitats need to be burned so they can stay healthy, seeds can germinate and weeds stay under control. Douglas worked with the Village of Oak Park two years ago to change local ordinances. Now residents who go through an application process and obtain proper permits can burn their native landscape yards. "When I first moved here and started planting natives, everyone else on the block had traditional landscapes," says Douglas. "But today, many more people on my street are planting natives." And that's a good thing, not only for the birds, bees and butterflies, but for other wildlife, the soil and the people who live here, too.